Never post anything on the Internet when you’re emotional. That is sound advice I’ve tried to follow because I’ve seen how words can come back to haunt you. Words published on the Internet can follow you for the rest of your life … and can be read by people all over the world. So I try to be very thoughtful and careful about my state of mind before posting to our blog or social media. The problem is that I’ve written seventeen blog posts during the past month. And if you’ve been counting you know that I’ve published, um, zero. I’ve held back on publishing because I’ve been flooded with all kinds of emotions this month … many of which I can’t find words to express and all of which, I fear, will lead our readers to think I’ve completely lost it. My wonderful friend, Gloria, is a life coach that recently completed Martha Beck’s Life Coach Training. For the past year she has coached me through my fears (of which there have been many) and helped me create a life that is truly authentic and joyful. She’s so good, that I no longer need to call her and schedule a session … I now hear her in my head. Little does she know that this morning she coached me, calmed me, and guided me through my emotional writer’s block. Coaching sessions in person are more fun because there are often Cosmos, snacks, and floating in the pool involved; however, it’s good to have her voice in my head as an alternate path to sanity. So this morning when I started to stress about all the exciting, and scary, and emotional, and life-changing “stuff” that is going on … and the fact that I haven’t written about ANY of it on our blog, I heard her calm, reassuring voice in my head. She said, “Terri, relax. First just breathe.” Then she guided me through a series of questions which allowed me to process it all, feel the emotions, and post a sampling of our recent experiences. Followers of our blog know that our brave, incredible son has inspired us to become passionate allies. I wrote about his journey as an example of how “it gets better” and I wrote a bit about our journey, as a family, in my previous blog post. My son chose to return to his former high school for his senior year, because he dreams of attending college and knew the alternative school was not providing the academic rigor needed. Although he has only a few friendly acquaintances at the high school, he bravely attended school every day and successfully managed, despite his anxiety and fears. He spent his senior year on the high honor roll and will be graduating with honors. He was accepted into the most competitive program at a prestigious college and has been awarded scholarships to boot! He has a beautiful life of promise and opportunity before him. So just imagine the emotions that have been flowing through me this month! Gratitude, relief, disbelief, magic, pride, more gratitude, and a knowing that there has been some divine intervention that got us here. The past five years have been so, so, SO difficult and heartbreaking at times. This morning, as I write this, I feel as though the entire struggle has been released. I will need a VERY big box of tissues for the graduation ceremony. We have been writing our book, Allies & Angels, for a long time. Our lives have been saved and changed by the many brave people who went before us, sharing their personal stories. To give back, and to make something good out of something that was once so very painful, we have chosen to share our story. We hope it will help increase awareness, acceptance, and compassion in the world. Last month we released a draft of our book for feedback, reviews and testimonials. Then we held our breath for what seemed like an eternity. I don’t think I’ve ever felt so vulnerable in my life. Our innermost thoughts, fears, and feelings about such a personal experience were now being shared. What if people don’t like it? What if they think we’re terrible parents? What if they think we’re terrible people? What if they laugh at us or shake their heads and say, “You really shouldn’t have quit your job…” Thank goodness my life coach is also a close friend, because I couldn’t afford all the coaching I needed while waiting for the reviews and feedback to come in. We survived the wait and were overwhelmed by the testimonials and early reviews. We’ve posted many of them on our book’s website, AlliesAndAngels.com. Our greatest hopes and dreams for the book were echoed back to us in many of the testimonials. I hope you’ll check them out and share with others. 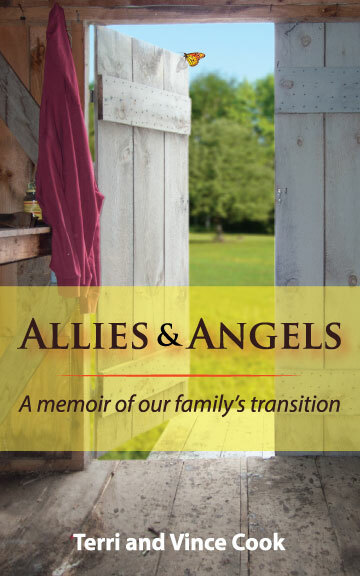 Allies & Angels Indiegogo Campaign and Free eBooks! Earlier this month we launched an Indiegogo Campaign to pre-sell our book and raise money for publishing and publicity. Less than two days remain… the campaign ends on Saturday, June 22. Please check it out and consider getting an eBook, paperback, or hardcover edition plus many other great perks. Please also share our campaign with others. We have a big dream, and we need your help to spread the word! We were victims of a lack of awareness and wish we had been better prepared. Our family, and the experts we called upon, struggled for nearly two years after our son’s suicide attempt to understand what was wrong. Our desperate efforts to diagnose and manage his depression and anxiety included weekly therapy, numerous doctors and specialists, and many different prescription medications. Although we were supported by a highly qualified team of doctors, educators, and counselors, it took years to connect the dots and recognize that gender identity was the root of the problem. More often, ignorance is merely a lack of awareness—when good people simply have not been exposed to information and experiences different from their own. We just didn’t know it was possible for our son to have a male brain inside a female body. Many of the professionals we worked with didn’t know either, or they had some awareness but not enough experience to recognize the signs. Children and their families often seek support for LGBT issues through school counselors, social workers, therapists, doctors, nurses, and youth center staff. The likelihood of a strong positive outcome increases when those professionals have experience or awareness of these issues. That’s why we are sharing our story, and conducting this Free eBook Campaign, to increase awareness … and compassion. The response we’ve already received has been overwhelming. Heartfelt comments have been pouring in from people who genuinely want to learn from our experience and use that knowledge to help other families and young people. Keep spreading the word! Together we are creating a world full of allies! The excitement during the past month and in the upcoming weeks is too much to squeeze into one blog post. In the coming weeks I’ll share about our travels to Rochester, Albany, and Philadelphia… and the amazing things that happened there. We’ve got some great ally stories to share which will hopefully reinforce that every one of us, through simple actions, big and small, can be an ally and make a difference in the lives of others. Earlier this week I attended a terrific program called “Safer People, Safer Spaces.” This 3 hour training, offered by the LGBT Resource Center at Syracuse University, was attended by students, faculty, staff, and community members. True to the course description, this training was as close to comprehensive as could be provided in that amount of time. The facilitators incorporated many different activities which engaged all of us to better understand and develop our sense of allyship. I was so moved to see such a diverse group of students, faculty, staff, and community members who were willing to give up 3 hours for this training. Students received no credits; this was not a course or job requirement. Each attendee simply had a desire to give of themselves to better understand others… and become a better ally. Allyship is a process built through relationships; it requires commitment, understanding, hope, and humility. We believe allyship also requires a dedication to continuous self-awareness and self-exploration. Recognizing and understanding the pervasiveness of privilege and oppression, both across and within identity groups, is integral to ally development. Allies are accountable for the influence and impact of their actions to the broader social world, and our goal is that allies will ultimately join in efforts to achieve liberation. Given that the training was offered by the LGBT Resource Center, and that most of the learning outcomes and activities centered on becoming a community of allies for people with marginalized genders and sexualities, I took particular interest in noting that the Statement of Allyship does not mention LGBT, gender or sexuality. You may have noticed that the Mission Statement for the Ally Project also doesn’t mention or restrict being an ally only within the LGBT community. Granted, we became passionate allies after learning our son is transgender. We were blessed to find countless allies in the LGBT community who guided and supported us through what was, at times, a very difficult and painful journey. Through our experiences we also learned first-hand of the inequities, injustices, and discrimination that still exist in the LGBT community. All of this led to our decision and commitment to help raise awareness and bring about positive change… and we became passionate allies. It is convenient to become allies to those communities most near and dear, but all too often we, including myself, are guilty of limiting our minds and our good intentions to only those communities. Finding love and compassion for all is a higher calling for allies, and so at the Ally Project our definition of an ally is purposely much broader and does not unduly restrict application to only the LGBT community. If we can look beyond our differences and consider how we treat all people… and have compassion and openness to all regardless of how we or they identify… we have hope for a world where nobody is marginalized or oppressed. Kudos to the LGBT Resource Center at Syracuse University and kudos to everyone who attended the Safer People, Safer Spaces training! I suspend judgment and elevate justice to its rightful place. Reality never changes, we do. our very bodies, our culture, our religion, and our politics are changing. we risk a world sitting lifeless like a rock waiting to erode.